The chart above looks at Oil & Gas Exploration EFT (XOP) over the past 8-years. From 2010 until 2013 it looks to have created a pennant pattern (series of higher lows and lower highs). Once resistance was taken out at (1), buyers came forward and XOP rallied nearly 30% in the next couple of years. 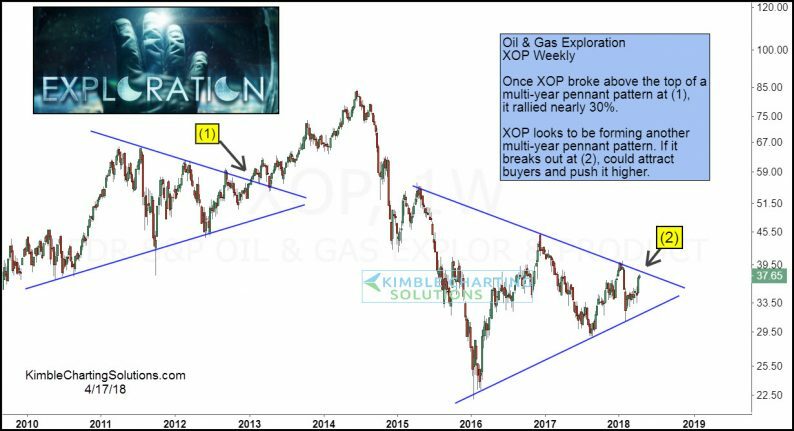 Over the last few years, XOP looks to be creating another pennant pattern. The top of the pattern comes into play as resistance just above current prices at (2). If XOP can breakout at (2), it should attract buyers similar to 2013. Keep a close eye on this pattern, as pennants often frustrate both bulls and bears and large moves take place once the pattern breaks.